ENO is one of the world’s largest opera companies, providing an annual programme of opera, from popular classics, and operetta, through to more contemporary work and rarely performed musicals. ENO wanted to communicate last minute ticket offers. ENO were able to mitigate any short-term sales downturn by maximising the value from unsold ticket inventory using SMS. SMS was also used to inform opt-ins of upcoming shows. The SMS activity generated an ROI rate of 16:1. 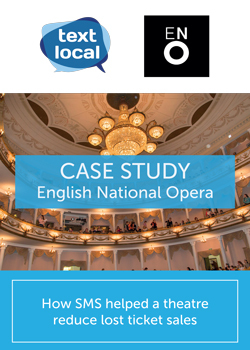 Download and find out how ENO achieved a ROI of 16:1 from using Textlocal’s SMS platform. Generated sales equate to well over a ratio figure of 10 times the total cost of the SMS campaign.